Children's Vision - Michael Ringel, O.D. 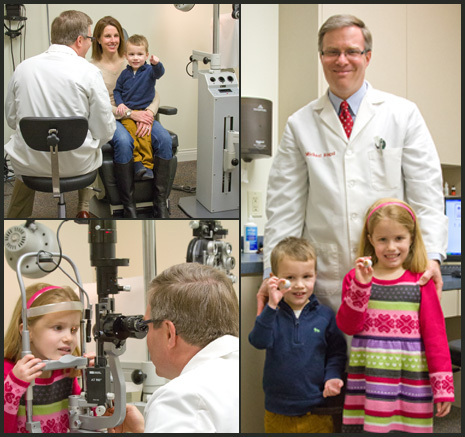 Curious when to bring your child to an eye doctor? The importance of your child seeing well cannot be overstated. The process of learning to see begins as an infant and continues on for many years. ​If your child does not receive the proper visual stimuli it may result in a permanent impairment of their vision for the remainder of their adult life. Q: "What age should I bring my child in for their first eye exam?" A: A child should have their first exam at the age of 2 unless a problem is suspected earlier. Q: "How can you examine my child when they don't know their alphabet?" A: As an optometrist we are trained to examine children without having them read from an eye chart. During their eye exam we will use eye drops to dilate their pupils. Once their pupils are dilated we use special lighted instruments to measure their prescription, also known as refractive error. Q: "My child already had their eyes tested at school or at our pediatrician's office why do they need to be checked again?" A: Both of these eye checks are simple screenings, looking for signs of a major problem. They do not replace an eye exam at an eye doctor's office. At Dr. Ringel's office we examine children age 2 and older. I provide comprehensive eye exams, diagnosis and management of lazy eye, treatment of eye infections in children like "pink eye". Our office carries a wide selection of fashionable children's eyeglass frames in all price ranges. I actively fit contact lenses in children who are interested.